The Fellowship was fortunate enough to obtain a copy of SUPURBIA #1 from BOOM Studios. The book is created and written by Grace Randolph with art by Russell Dauterman. It appears to be a normal neighborhood, but these are the homes for the members of the super hero team – The Meta Legion! The team is having a party welcoming a new neighbor and member in Robert (Bulldog) White and his newlywed wife Eve. However, things are not as they seem as some secrets are discovered, and the biggest one is yet to come! This mini-series is dubbed “The Real Housewives” of Superheroes tale and I think it’s an unfair. This is way better than that. The book is a realistic look at the private lives of heroes and their families. The camaraderie between the members of the Meta Legion reminds me of the Geoff John’s run on Justice Society of America - it’s one big family. These are real people with real issues and problems. Grace Randolph’s writing is smart, witty and this book was a fun read. 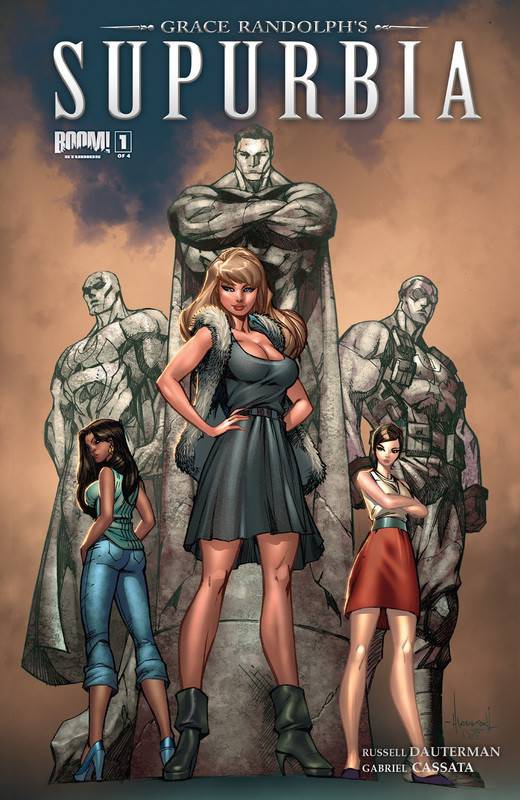 Russell Dauterman’s cartoonish style works for the superhero genre and is pleasing to the eye. I can’t wait to see what happens in the next issue! SUPURBIA #1 is in comic book stores now or available at www.boom-studios.com.